The Congress on Tuesday said it was Prime Minister Narendra Modi who "insulted" India on foreign soil, after the BJP accused Congress Vice President Rahul Gandhi of belittling the Prime Minister in his speech at a US university. "We are surprised at the criticism that is unwarranted and unjustified made by the government and ruling party. 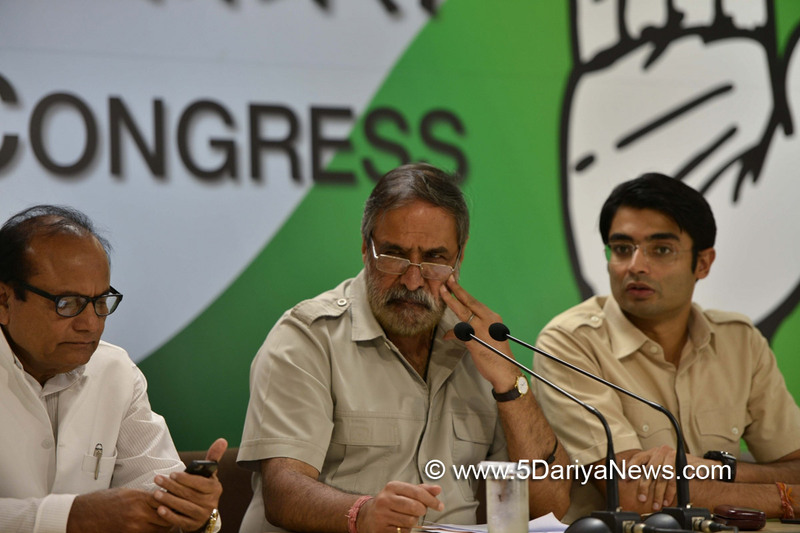 The statements and issues raised by Union Information and Broadcasting Minister (Smriti Irani) shows ignorance of history and her eagerness to be an apologist for the Prime Minister (Narendra Modi)," Congress leader Anand Sharma said on Tuesday. "Rahul Gandhi spoke about India's achievements in the last 70 years. We understand why BJP is criticising him. If Rahul Gandhi is criticising the Prime Minister of the country, no one should have any objection to that. It's a feature of democracy," he said.Irani, at a press conference on Tuesday morning, criticised the Congress Vice President's speech at University of California, in Berkeley, and said Rahul Gandhi chose to belittle the Prime Minister.The Information and Broadcasting Minister also said that Rahul Gandhi chose a "platform of convenience to berate his political opponents" after failing to connect with the people of India. "It is the Prime Minister of India who is guilty of insulting India on international soil. The Prime Minister called the country corrupt on his first visit abroad and also said on another occasion that Indians used to feel ashamed to accept they are Indian on foreign soil," Sharma said.He said it was part of the ruling Bharatiya Janata Party's intolerance towards criticism. "It is the streak of intolerance towards criticism by BJP and the present government," he said. Rahul Gandhi in his speech at Berkeley attacked demonetisation, and said the decision that removed 86 per cent of cash from circulation overnight and was carried out unilaterally without asking the Chief Economic Advisor, the Cabinet or even Parliament "imposed a devastating cost in India". "Yes, it is true that there are dynasties in India. There have been dynasties in every country of the region -- in Asia, Europe, Africa, North America -- both United States of America and Canada," said Sharma referring to Gandhi's reply on dynasties. "When it comes to the Nehru-Gandhi family, there have been five generations in the service of the country. Jawaharlal Nehru did not think nor did Moti Lal Nehru, when he gave up all his riches that India will become free and Congress Party will become the ruling party of the country. "Nehru, when he went to British prisons, faced their lathis and remained in solitary confinement, did not think that he was going to be India's Prime Minister," he added.He also went on to say that both Indira Gandhi and Rajiv gandhi were elected by the people of the country. "After Rajiv Gandhi took oath of office as Prime Minister in January 1985, for 32 years, there is no member of the Nehru-Gandhi family who has accepted or taken oath of office. "Rahul Gandhi was also an MP when UPA was in office, Sonia Gandhi was elected as the leader. It was their conscious decision at that time," he added.Sharma also said: "We reject the criticism with the force of truth, facts of history and with contempt for those who have neither contributed to make India what it is, but have only belittled and insulted the predecessors."